Panama is renowned as a top destination for expats, but what is it about Panama City that makes it such a great place to live and work? Awarded 8th place for career prospects and satisfaction in Internations’ Expat Insider 2018, it’s clearly an attractive option for those looking to secure a career here. This article will look into the opportunities that Panama City offers, providing useful information on lifestyle, healthcare and culture so you know what to expect upon arrival. The capital – Panama City is the largest city of the Republic, its skyline an eclectic mix of skyscrapers, modern office buildings, condo complexes and hotels, boasting views of the Bay of Panama. Perhaps a more unique feature of its landscape is the man-made Panama Canal, often considered the most important asset to its economy. Spanning 82km in length, it provides numerous employment opportunities for those looking to work in the transportation and logistics services. Situated at the Pacific entrance of the Panama Canal, Panama City is in heart of this thriving hub of activity. Since the canals expansion in 2016 these opportunities have only increased. In fact, Panama’s U.S. dollar–based economy is among the fastest growing in the region. Trade plays a key role in this, with the combined value of exports and imports equalling 94 percent of GDP. Meanwhile, the city is considered the political and administrative centre of the country, generating more than half of the country’s GDP. 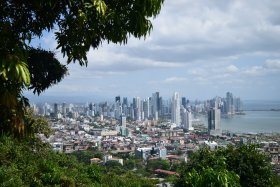 Should you choose to look for work in Panama City, there are a few things to consider. There are many options available for expats, but a basic understanding of Spanish is often expected by employers, and a work permit is essential for those without residency. There are various ways to obtain a work permit, as well as alternative routes around these initial hurdles. If you choose to apply for a visa on your own accord, you should start the process as early as possible, to expedite the infamously extensive process. To prepare, it is wise to check the documentation requirements. You may also be required to deposit a sum of money into a Panamanian account as part of the visa process. In recent years the government have introduced new types of visas for temporary working periods, but the two main visas for permanent work remain as the Professional Residence Permit and the Friendly Nations visa – open to nationals from specific countries. Check your embassy website for additional information and how to apply. As a major commerce and banking hub, Panama City is home to some of the world’s largest banks and multinational corporations such as Dell, Adidas and Nestle. These global headquarters are generally larger than their local counterparts, and so they may be in a better position to help with your work permit and offer you a more attractive salary. What’s more, they are not restricted by the percentage of foreigners they can hire, unlike the 10% limit imposed on Panamanian companies. To really reap the rewards that Panama City can offer expats, looking for employment in specialist roles or as a high-ranking manager in an international firm is the most direct route to the incentives available. For non-managerial job positions there are only really a few feasible options such as becoming an English teacher, a translator or a real estate agent. With a metropolitan area population of 1.6 million, and a large expat community, networking is often the best place to start when setting out to find work. In addition to word-of-mouth, or if you haven’t yet relocated, online sites such a Panama’s professional and business directory can be useful. Consulting recruitment agencies, or independently scrolling job-sites can also lead to a successful appointment. Although there are online editions of Panamanian newspapers, these often advertise jobs with local businesses which, as discussed, aren’t always ideal for expats. Although the salaries are relatively low, should you choose to live in Panama City you will also enjoy a low cost of living, as it is approximately 41% cheaper to live in Panama than London. The average wage is also priced at 759 USD – one of the highest in the American continent, confirming the relative economic strength of the country. Income tax in Panama is also considerably lower than other countries which is why it can be seen as a tax haven. The level of tax to pay will depend on the income you earn, but you can enjoy a tax free amount of 11,000 USD annually. Anything up to $50,000 is charged at 15%, which goes up to 25% on earnings in excess of this. Expats can even enjoy some exemptions on duties and property taxes, but this will depend on the visa. Although the salaries may not be particularly high, the work-life balance reflects this, with expats rarely reporting feeling over-worked. The working day typically runs between 8am-5pm, but a long lunch is often enjoyed between 12-2pm. Most companies offer employees a generous holiday allowance of 30 days, with 13 additional public holidays. If you are requested to work on any of these public holidays, the pay will be doubled, something of a rarity elsewhere in the world. This laid-back lifestyle can certainly take some getting used to. The locals are known to embrace the ‘mañana effect’, meaning ‘tomorrow’ or an unknown time in the future, referring to their slower approach to life. Although the level of healthcare quality varies across the country, generally the best facilities and physicians can be found in Panama City. Punta Pacifica is located there and is considered to be one of the most advanced hospitals in Latin America, with bilingual staff owing to its links with the Johns Hopkins Hospital in Maryland. It is wise to be prepared for your move by taking out international health insurance to ensure you can access private health care, as healthcare bills are required to be paid immediately. With all the free-time you may find yourself having, Panama City has lots to keep you entertained! Often dubbed the Miami of Central America, there will be many other expats to meet in the cosmopolitan area. International phone calls should also connect easily, keeping you in touch with friends and family at home, with high-speed internet the norm. Although modern amenities are easy to access, expats in Panama City will also be able to appreciate the country’s cultural diversity, with many UNESCO World Heritage Sites preserving the rich history. An afternoon can easily be spent taking a walk through one of these sites, like the historical district of Casco Antiguo, and exploring the different architectural styles. Panama City is also becoming one of the world’s leading culinary destinations, with a wide variety of high-standard cuisine on offer, for a lot less than you’d expect elsewhere. For such a small country, even smaller than South Carolina, there’s a great deal of variety in its landscape. From hiking trails like the Los Quetzales trail, waterfalls and hot springs, to beach days where you can enjoy fishing, scuba diving, or surfing. You could even retreat to one of the 1,518 islands off its shores, or the cooler mountain region which runs down the central spine of the country and enjoys a year-round spring climate. Expats are often drawn to Panama for the quality of life it can offer them. It’s a winning combination of a laid-back lifestyle, enjoyable climate, unspoiled landscape, fresh air and a first-class healthcare system, making it a top choice for those seeking an improved work-life balance.